Roxton Fone has released a quick demo of sampler & scratching on DJControl Compact & Djuced 18. At CES 2015 in Las Vegas, Hercules - a leader in mobile DJ controllers - is thrilled to announce DJControl Jogvision: the 2-deck controller which is set to change the way that DJs perform using a computer. DJControl Jogvision is bundled with the Serato DJ Intro mixing software. DJControl Jogvision is the first mobile DJ controller to feature a display in the centre of each jog wheel, simultaneously indicating both the playback speed and position in the track at a glance. These displays allow DJs to spend less time looking at a computer screen, for enhanced focus, faster responsiveness and better track syncing - paying more attention to the music and their audience instead. - the smaller ring (in the centre) indicates the position within the track, represented by way of 16 segments: the number of illuminated segments shows the current position in the track - from 1 segment at the beginning, to 16 segments at the end. When scratching, the screens guide the DJ by indicating the amount of angular displacement: in the display, the DJ sees the position that his or her hand can return to. By allowing DJs to intuitively perform based on what they see right at their fingertips, and by offering precision and speed unmatched in this sector of mobile DJing, DJControl Jogvision has been named a 2015 CES Innovation Awards Honoree. Computers have taken their place in the world of DJing in the same way as CD players and vinyl turntables. However, DJs often lament the fact that having to keep on looking at a computer screen is distracting - constantly turning their gaze to see what’s taking place on the computer, instead of checking out the crowd or focusing on their hands while mixing. Up until now, DJs have been forced to watch a computer screen in order to see at what speed a track is playing, how much time remains before the end of the track, or - when scratching - to easily locate a scratch position. The dual displays on the DJControl Jogvision’s jog wheels replace all of this information in the DJ’s eyes: the larger ring turns at the track’s playback speed, based on a speed of 33⅓ rpm, while the smaller ring indicates the position of the cursor in the track (1 illuminated segment = start of the track, 16 illuminated segments = end of the track, 8 illuminated segments = middle of the track). And while scratching, the larger ring shows the amount of angular displacement, allowing the DJ to easily locate scratch positions. - a line input for connecting an external audio source. In this way, DJControl Jogvision lets DJs enjoy high-quality sound everywhere: in the studio, at concerts, in clubs, while hosting an event or at parties with friends. The 2 sets of 4 drum-style pads allow the DJ to trigger audio samples or jump from cue point to cue point, just by tapping on the pads. Variable-colored backlighting shows the DJ which command is assigned to a pad. The Air Control function is a contactless sensor, which allows the DJ to control effects in real time simply by varying the distance between his or her hand and the sensor: it works just like magic, and lets DJs perform these gestures at a height at which they can be seen by the whole audience. DJControl Jogvision comes bundled with Serato DJ Intro: designed for music lovers, Serato DJ Intro allows for 2-deck digital music mixing on a PC or Mac, to which DJControl Jogvision is connected. To check it out for yourself, please join us at CES Las Vegas, the Venetian Hotel, Veronese 2504 meeting room, from January 6th to 9th, 2015. Hercules announces new DJConsole RMX 2 and World Tour event! 2 sets of 4 backlit velocity sensitive pads enable DJs to control loops, effects, samples and cue points; DJs can use the pads to trigger instant controls or, by varying their velocity, can control the sound amplitude. The rotary encoder located in each set of 4 pads can be used to modulate the last control triggered on a pad after a hit. 5 faders and 10 rotary potentiometers in 14-bit MIDI mode offer extreme precision for mixing. The cross-fader can be replaced with a Mini-Innofader® control. 1 balanced microphone input (XLR/Jack combo), ideal for talkover applications, suited to both balanced high-end microphones and non-balanced consumer microphones. The Hercules DJConsole RMX2 will be supplied with two DJing software apps: DJUCED™ 40° and VirtualDJ® 8 LE. Availability: starting mid-August 2012, at a suggested retail price of $299.99 / €299,99 / £279.99. The Hercules DJConsole RMX 2 launch will also involve the World Tour: It’s Your Turn event, which will run from the end of summer until the end of the year, allowing DJs to practice mixing, learn new techniques, enhance skills, participate in DJing contests, and team up with emerging DJing artists to share their unique passion. More pictures to come on the Hercules DJ Mix Room Facebook page. New York, November 3, 2011 - Hercules, a leader in mobile digital DJing controllers, is proud to unveil the Hercules DJ Control AIR, the first portable USB DJ controller to feature air control, in addition to touch controls (for PC and Mac®*). Taking a great leap forward in the world of mixing, Hercules has created an intuitive ensemble of controls on a unique mobile control surface. These controls have typically been only available to seasoned musicians via multiple controllers, each of which is programmable and/or dedicated to a specific function. The DJ Control AIR also features built-in audio outputs. AIR, or "Adjustment by InfraRed," is a totally new control for computer DJ mixing consoles. The infrared proximity sensor built into the unit lets DJs control their choice of function (volume level, effects, etc.) without touching the controller, simply by moving their outstretched hand above the sensor. It’s like there’s magic in the air when performing a set! The AIR control functions regardless of the ambient lighting, allowing users to modulate a software setting quickly and intuitively no matter where they are entertaining. Thanks to its two pressure-detecting jog wheels, DJ Control AIR is perfect for scratching. The jog wheels, each 4" in diameter, detect the pressure exerted by the user’s hand. As a result, the feeling when scratching is as natural as when scratching on a vinyl record or a CD turntable - ideal for learning and perfecting scratch techniques, just like on professional DJ hardware. The jog wheels also allow for easy control of the pitch bend function, as well as browsing through playlists. In the style of celebrity DJs, Hercules has included 2 sets of 4 progressive pads for users looking to control sounds with a minimum of gestures. These pads transmit a command and its velocity, to control loops, samples or effects. Just tap your finger on a pad to play an effect, for example: the pad lights up when touched, and transmits not only the On/Off command, but a gradual command as well. This lets the user easily vary the attack of a sound sample, or its volume, or modulate the amplitude of an effect. The backlit pads, along with the lighting on the other controls, allow for easy viewing even in low-light or dark conditions. DJ Control AIR includes a VU meter displaying beats composed of 2 lines of 4 LEDs. Each line displays the beats in a track, allowing DJs to see at a glance whether the beats are in sync, without having to look at their computer screen. In this way, the DJ can stay focused on the crowd: if the LEDs light up at the same time for both tracks, then the 2 tracks are synchronized - and this, of course, is the basis of all mixing. - To play the mix over speakers: one 3.5 mm stereo mini-jack output. - To preview tracks on headphones: one 6.35 mm stereo jack output. The controller is bundled with a DJing software: a powerful application that lets you mix, sync and manipulate tracks, and add your own personal touch to the music with the sampler and the arranger, while providing an intuitive graphical interface, for use with Mac® and PC. 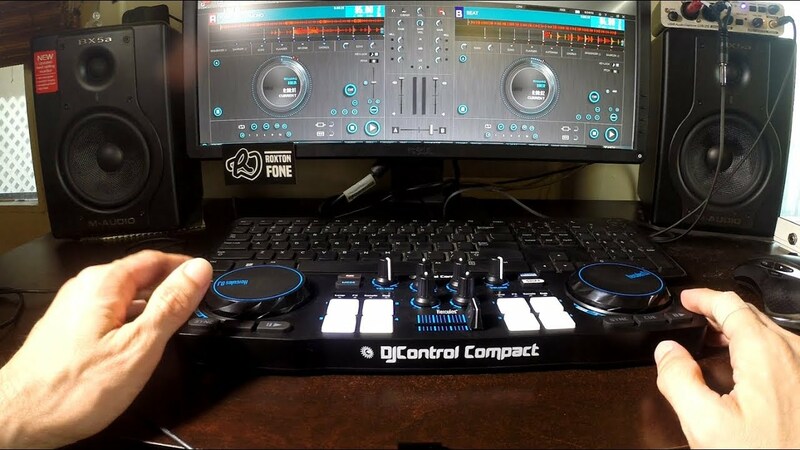 Hercules DJ Control AIR is the versatile, innovative digital DJ controller that lets amateur DJs get mixing right away: all you need is a computer, headphones and speakers, and you’re ready to go. Released in November 2011, at a suggested retail price of $169.99.